Minnesota sits in ninth place in the Western Conference, with a record of 5-9-3. They are currently on 18 points from 17 matches, four points below the line and only two from the bottom. Their -14 goal differential (24 for, 38 against) is the second-worst in MLS, besting only Real Salt Lake’s -20. Minnesota does lead the league in one category – Goals Against (38). The early part of the season was not kind to the MLS newcomers. Outscored 11-2 in their first two matches, coach Adrian Heath found his club behind the 8-ball early, with very clear deficiencies in the defending half and not a lot of time (or personnel) to make changes. A 2-2 draw against Colorado in their third match would see Minnesota nab their first points of the year, only to be beaten down once again the following week by a brutal 5-2 score line at New England. That’s been the way of things for the expansion side when playing away from home. The Loons are being outscored by a ridiculous 23-9, and are winless on the road. Minnesota’s back line has of course struggled in their inaugural MLS season, but the strength of this team has been it’s attacking quartet of Miguel Ibarra, Johan Venegas, and Kevin Molino topped off with Christian Ramirez at the top. While Molino and his seven goals are familiar to the Boys in Blue, Ramirez will be a new challenge for the City defense. Leading the team in goals with nine, the man they call Batman has found the back of the net three times in his last six matches. Tactically, the Loons line up in a 4-2-3-1 and try to utilize the wide play of Ibarra and Molino to feed Ramirez. It will be interesting to watch how they adapt to the narrow pitch at Yankee Stadium. NYCFC has taken points in four of their last five and extended their win streak to a season-best three matches last weekend against Red Bulls. They currently sit third in the East with 30 points from 17 matches with a record of 9-5-3. City is tied for second in the league with 31 goals (Atlanta leads with 33) and are third in MLS with a +11 differential. New York City will once again find themselves without central midfielder Maxi Moralez, who has returned to training in a limited capacity but is not yet ready for game action. Tommy McNamara has been getting the starting minutes in his place, playing centrally in a 4-2-3-1. The rest of the XI should remain mostly the same as it’s been the last two matches; the notable exceptions being Ronald Matarrita’s return to left back, replacing Derby hero Ben Sweat, and Eirik Johansen‘s return, replacing Gold Cup-bound Sean Johnson. “If we don’t have the same concentration and focus that we had against Red Bulls, we will not have any chance of winning against Minnesota. This match has all the makings of a “trap” game – midweek, after an inspiring win and against a weak opponent. The last time NYCFC found themselves going into a trap game was in week 11 against Real Salt Lake – a match they lost 2-1. The starting eleven in that match featured heavy rotation, something we shouldn’t see this time around. 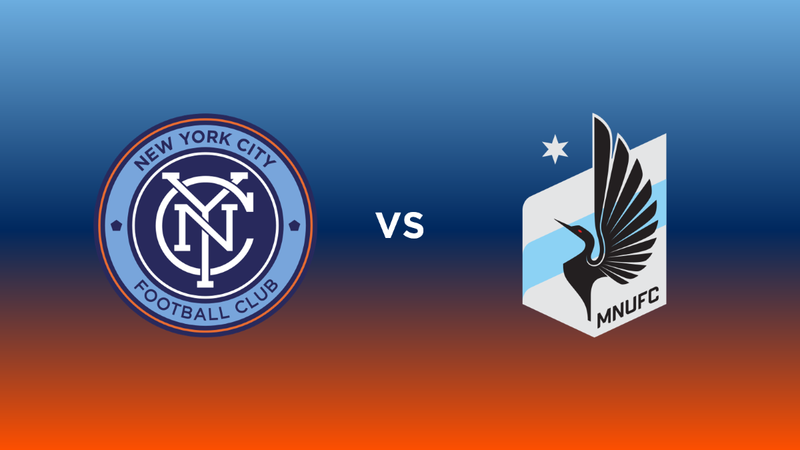 It will be imperative for Alex Ring and Yangel Herrera to deny Ramirez service from the Minnesota midfield – a task they have been up to against tougher opponents. Limiting bad giveaways in the midfield will also be of top importance, as Molino, Ibarra and Venegas have speed to burn and can punish those mistakes effectively. Minnesota has a lot of experience playing from behind, so early goals should not be sat on. The Loon attackers may also try and put pressure on the inexperienced Johansen when trying to distribute, but Maxime Chanot and Alexander Callens should be up to the task of asserting their presence.